Cast Iron, Steel, Acrylic, Fiberglass, Ceramic, etc. Is your bathtub or shower worn out and looking shabby? Do you have beautiful bathroom fixtures and counters from the 60’s, 70’s, or even earlier in those not so beautiful colors? Are you living with the previous owner’s decorating scheme? Have you put off remodeling your bathroom because of the high costs or the invasive and inconvenient procedures? If you answered yes to any of these questions, we can help! Reglazing makes your Bathtub and Tile like Brand NEW!! Replacing a tub has been known to take weeks – and especially if it’s your only bathing area, that can add up to a whole lot of inconvenience. Refinishing your Bathtub and Shower enclosure will take from 3 to 5 hours and you can shower or bathe in it the very next day. A light estimate for replacing a bathtub is between $2,000 to $4,000! We can refinish it in your choice of colors for well under one fifth that price. 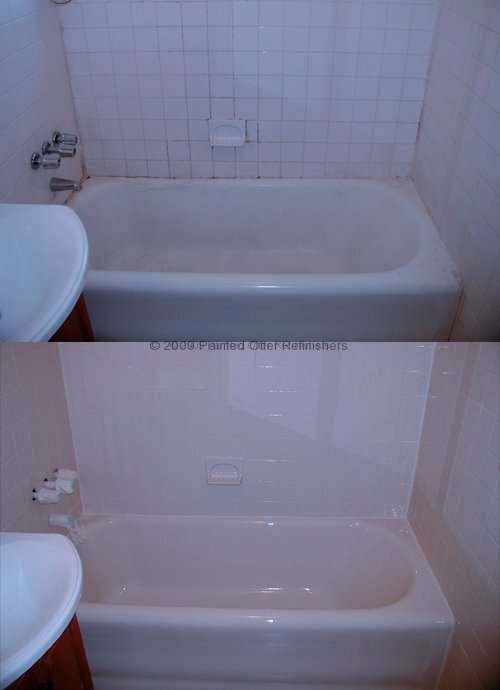 Bathtub & Tile refinishing means you don’t have the mess, hassle and added expenses of demolition, plumbing changes, and repairing the walls and floors around tub which were damaged during removal. A refinished fixture can last 15 to 20 years or more with proper maintenance. Bathtub refinishing, Tile refinishing, Sink refinishing, and Countertop refinishing are ideal solutions for repairing small chips and cracks in fixtures that are otherwise in good condition. And our refinishing materials can be applied to virtually any surface! If you’re wondering about the process and if we can help you, give us a call and we’ll be more than happy to address your needs. High quality refinishing results depend on quality prep work. We take great pride in providing the most extensive and meticulous surface preparation in the business. Our process will ensure not only that the finished product looks and feels amazing and brand new, but that it will continue to do so for a very long time to come. We tell every caller our exact procedures and encourage them to compare the services we provide to what they’ve been offered by other companies. We offer the best warranty in the business! A Five (5) year full warranty on all material or manufacturing defects comes standard along with our guaranteed 100% customer service. We are a locally owned and operated non-franchised business. We want to answer any questions you may have now, while we are refinishing your fixtures, the day after, or even years later. Call now or contact us online and we will respond within 24 hours, guaranteed! !